So Comfortable for both of us!! We love our Mei Tai so much!! When my daughter was an infant we were given another type of carrier which I found uncomfortable to wear for any length of time, even when she was tiny, and she didn't seem very comfortable either. We didn't get this until she was eight months old and we haven't looked back since. She was already mobile and so independent but she didn't mind being in the Mei Tai from the first day and now at 26 months she still goes happily into it. And at 25 pounds I am still comfortable wearing her in it! Last fall my daughter, mother and I had to fly out of state for a family emergency without my husband to help carry things. There we were, mom baby and I in the airport with suitcases, stroller and car seat. I really don't know what we would have done without the Mei Tai. I was able to ear her all through the airport, through security and onto the plane... and have her safely contained while I got her car seat installed. This is my new favorite gift for friends who are expecting!! I have the regular Mei Tai, but this one looks 10x better. It is very easy to use, comfortable, and light weight! You can wear your baby in front of you, behind you, and there's even a way to hip carry, all while having free hands!! It comes in handy when you need to get stuff done, but your baby doesn't want to be put down. Safety The straps are durable. They are easy to tie and stay in place! The back carry is a little hard to do alone, so a helper is definitely needed. Baby's Comfort My daughter falls asleep in the Mei Tai every time. If that doesn't say comfort, then I don't know what does! The fabric is soft and doesn't not rub against their legs. Parents' Comfort I can wear my baby for hours!! The knots you tie are not uncomfortable and he fabric is soft. I love the padding on the straps that go on my shoulders. 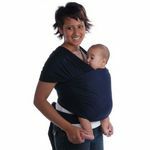 Ease of Use I can successfully and safely tie, wrap, and place my baby in the Mei Tai in under 5 minutes. Of coarse everything takes some practice, so a helper is a must at first. It is also very easy to nurse in; just loosen the should strap so baby is at breast level and re-tie. Design I don't think I've seen a print I DIDN'T like! Durability Made with high quality fabric. Hands down the most comfortable carrier for baby and mom. Before purchasing this carrier I had given up on being able to wear my daughter. I had tried baby biornj, moby, slings, and the snuggli. As a plus sized woman none of them fit comfortably for me or my daughter. They either slipped,pulled or killed my back. Then one day at a baby expo I was desperate to get my sweetie to take a nap she was sooo cranky. One of the ladies selling these carriers suggested I try it. I just knew it wouldn't work then with in miniutes after puting her in the carrier she was out like a light! To make it even better it felt like she wasn't even there. No pulling or slipping. I spend hours at that expo and she never woke up. The mai tai is very easy to put on and the fabric is washable and comes in so many prints. This is a must have!!! 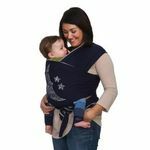 I ABSOLUTELY love the mei tai wrap I would never use a snugli or 'baby carrier' of the sort again, I have a few different mei tai's in different patterns and fabrics. 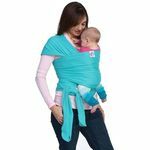 I absolutely love them I would highly recommend this wrap to any mother as it is very versatile and adjustable to any size. I have been using mine since my daughter was about 6months old and she's 3yrs now and still loves it. I use it when we go to the grocery store, on my back, so she can 'help' pick out veggies and can fall asleep if she gets tired. Again I LOVE this product and wouldn't have it any other way! I am a petite mommy so I can never find a wrap that fits quite this well.